I am writing in response to your letter, dated September 21, 2004. In that letter, you voluntarily enter into the Kagyu controversy surrounding the recognition of the 17th Karmapa. Since it is now, and has been in past generations, the responsibility of the Shamarpas to handle such matters, I feel obliged to respond. It is especially crucial for me to clearly reply to all the points you make because you are a well-known and well-respected professor of Tibetan Buddhism in the United States. As someone who has a lot of influence in the context of American Buddhism and whose words many people trust, it is my wish that you take seriously the effort I am putting into clarifying some apparent misconceptions. First I will respond directly to your letter, then pose a question to you, then in the end give some suggestions which I hope you will take seriously. I am currently in Washington D.C., so if you wish to challenge or question me on any of the points I make below I encourage you to do so. I regret to learn that Lea Terhune’s account of the 17th Karmapa, Orgyen Trinley Dorje, in her book Karmapa: the Politics of Reincarnation, has become the subject of a lawsuit in India. This is surprising, since her perspective on the Karmapa and the unfortunate controversy that developed within the Karma Kagyu lineage over his recognition, is valid and reasonable. While it is clear that Lea Terhune supports Orgyen Trinley Rinpoche as the genuine Karmapa, she in fact hardly addresses that issue in her book at all. As far as the contend of the book goes, it takes up only the smallest chapter. There is much more going on in her book, and it is on the basis of those other points that she is being sued. In fact, her support for Orgyen Trinley Rinpoche is not an issue and is not being addressed in court at all. It seems you have completely missed the point of what is going on in the court case. We in fact did not have to sue her for that particular point because there have already been two famous cases addressing this matter: one In India and one in Auckland, New Zealand. In both those court cases, the supporters of Orgyen Trinley Rinpoche provided as much documentation as they could and tried to prove that legally the authority to recognize the incarnation of the Karmapas is in the hands of His Holiness the Dalai Lama. Since that claim, however, goes against all the traditional unbroken norms of our lineage, they lost both court cases and were totally refuted. 1. Terhune claims that I murdered Jamgon Kongtrul Rinpoche. 2. Terhune claims that General Secretary Topga Rinpoche sold the Karmapa’s monastery in Bhutan to the Bhutanese government in order pay off his own personal loan. 3. She claims that before I recognized Thaye Dorje Rinpoche as Karmapa, I had tried to recognize a Bhutanese prince as the 17th Karmapa. (KIBI) in New Delhi transferred to my own name. 5. She claims that my family is connected to CIA. 6. She claims that I bribed the Indian government to prevent Orgyen Trinley Rinpoche from going to Sikkim. The court case concerns these six points alone. As you can see, only the last has anything to do with Orgyen Trinley Rinpoche, and even that has nothing to do with his recognition as the Karmapa. I have come to the conclusion, after much experience in this country, that many professors, students and journalists here are what I refer to as “package believers”. By package believer, I refer to people who fail to examine the details of any given situation. In this case, even you, a highly respected professor at a top university, did not bother to examine the particular details of the case you are responding to. This is disappointing. When Lea Terhune was called into a court case about her book you jumped to conclusion that it must be about the recognition of Orgyen Trinley as Karmapa and issued a statement to that effect. 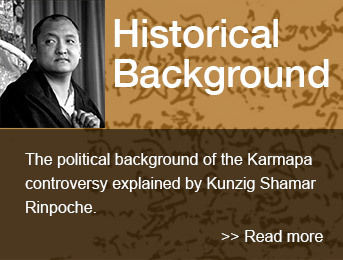 The recognition of the 17th Karmapa was done according to the traditions of the Karma Kagyu lineage. A cryptic letter left by the previous Karmapa was discovered by one of his chief lamas, Tai Situpa, and then interpreted before it was brought before His Holiness the Dalai Lama in June, 1992. H. H. Dalai Lama also confirmed the recognition, not merely as a bureaucratic formality, but because he, too, had a spiritual insight that corroborated the details given in the recognition letter. First of all, with respect to the recognition of the 17th Karmapa, neither the Tibetan Government in Exile nor H. H. Dalai Lama examined the letter that Tai Situ Rinpoche claims was written by the late 16th Karmapa. The letter he produced was locked into a golden gao, with a hair from Guru Padmasambhava and some other holy relics and it should still be at Rumtek Monastery, unless it was stolen in 1993. While the late Karmapa’s administration was prevented from properly testing the letter forensically, they did examine at least the handwriting. Comparing it with letters written by H. H. 16th Karmapa and letters written by Tai Situ Rinpoche, it was discovered that each and every word written looks like it was written by Tai Situ Rinpoche himself and not by the 16th Karmapa. Again, I remind you the neither the TGIE not H. H. Dalai Lama ever had a chance to examine that letter. Since the 17th century, around the time of the 10th Karmapa, when the Dalai Lama became temporal and spiritual head of Tibet, the Tibetan government has required that the Dalai Lama giver permission for the enthronement of the Karmapa at his seat, Tshurphu Monastery, which is located near Lhasa, Tibet. According to historical records, the 11th, 12th, 13th, 14th, 15th and 16th Karmapas never had any approval or examination from the then government, which at that time actually had authority over a country (as opposed to the current government in exile which doesn’t have any legal authority). Among those Karmapas, the Dalai Lamas were never called upon to approve or confirm their recognition. After the death of the 12th Karmapa, the 13th was recognized by the Nyingmapa Lama Kathok Rigdzin Chenmo, who was a favourite Lama of the 12th Karmapa, the 8th Shamarpa and the 8th Situpa. Kathok Rigdzin Chenmo was also a friend of both the 7th Dalai Lama and Pholhawa, the King of Tibet. The 7th Dalai Lama and Pholhawa the Desid of Tibet, both gave their support and assistance to the process of recognizing the 13th Karmapa, but even then were not called upon to approve him. I will also point out that Kathok Rigdzin Chenmo’s great service to the Karma Kagyu, recognizing the 13th Karmapa, did not start a new tradition of Karmapas being recognized by the Nyingmapa Kathok monastery! What I am trying to point out to you, is that even when the Dalai Lamas and the Tibetan Government had the power as the ruling government of Tibet to impose their interests on the Karma Kagyu they didn’t do it; even after the time of the 10th Karmapa, all later Karmapas were recognized by either a Shamarpa, a Drukchen Rinpoche, a Situpa Rinpoche, or sometimes (as in the case of the 13th Karmapa) a favorite Lama from another school. Once instance where the Dalai Lamas and the Tibetan government did try to interfere in the process of recognizing the Karmapas was during the time of the recognition of the 16th Karmapa. At that time there was a boy, the son of the finance Minister Lungshawa, whom the 13th Dalai Lama recognized as the 16th Karmapa. Karma Kagyu lamas, on the other hand, recognized a boy from the Athubtsang family of Derge. They rejected the 13th Dalai Lama’s candidate, and the 13th Dalai Lama accepted that rejection and acknowledged the Kagyu chosen candidate. That candidate grew up to be H. H. Rangjung Rigpe Dorje. That the Shamarpa (the plaintiff in the case) has had a role in the recent controversy over the recognition of the 17th Karmapa is undeniable. Although the Dalai Lama issued numerous statements confirming and later reiterating the authenticity of Orgyen Trinley Dorje as the 17th Karmapa, the Shamarpa has persisted in his efforts to promote a rival candidate and denigrate the recognition of the Karmapa and those who confirmed his recognition. This has been widely reported in the international press. While the Shamarpa may have supporters who subscribe to his version of the story, the view that the Shamarpa holds, i.e., that his candidate Thaye Dorje is the 17th Karmapa, is not generally accepted among Tibetans, and not at all by the Tibetan government in exile and the Dalai Lama. The Tibetan government did examine the Shamarpa’s claims, but since he failed to present convincing evidence to support the claims, they were dismissed. The TGIE never asked me for proof of my own recognition of the 17th Karmapa. I also never requested their approval, as they are not in a position to ask for such proof. Why? Because when you recognize the reincarnation of a Lama, the past Lama’s spirit had to come from Nirvana or the Bardo to a new human form. At that point, the appropriate spiritual teachers recognize it. And when one is such a spiritual leader, that Lama is recognized either by seeing it directly from one’s supernatural mind, or via the prediction of one’s personal yidams (white or green Tara, for example, or Dharma protectors). There exists no tradition of asking for proof of such types of recognition. This is because the process is beyond what people can perceive with their normal senses. So I myself, being a Shamarpa, I am the proof of the authority to recognize Karmapa according to the traditions of the Karma Kagyu lineage. If I had produced a letter which I claimed was written by the 16th Karmapa, then my letter would have been examined by the 16th Karmapa’s own administrators if they had any doubts. They have the right to evaluate the authenticity of such a letter if there are any doubts. Additionally, if my personal prediction contradicted a letter which they deemed to authentic, they would have the right to veto my recognition of the Karmapa. That power to veto would depend on the Karmapa’s administration proving publicly that the letter is authentic and that it contradicts my prediction. Then the final decision would depend on where the more convincing proof lies. No Shamarpa has had to ask for approval or provide proof to the Dalai Lamas or to the Tibetan government. I recognized Thaye Dorje Rinpoche as the 17th Karmapa in 1993. He and his family then escaped in 1994. I myself declared to the world he is the Karmapa and enthroned him at Bodhgaya in 1996 without any confirmation from or contact with either the TGIE or H.H. Dalai Lama. It should also be mentioned here that the recognition of reincarnate Lamas is not conducted by popular vote. The number of devotees or supporters has never been a valid means of establishing the authenticity of a teacher. Many Karmapas and Shamarpas have led quite solitary lives, spending many years at a time in retreat and with few disciples. That has never caused anyone to doubt their authenticity. The controversy is not without precedent in Tibetan history, as Ms. Terhune points out in her book. But it is historically significant now because, in the 21st century, the dissension is not confined to a remote Tibet, but affects followers of Tibetan Buddhism throughout the world. Here I agree with you completely. However much you are concerned by this issue – as you clearly are – I’m sure you can be sympathetic to how much more concerned I am. Traditionally, the Shamarpas lead the Karma Kagyu lineage in concert with the Karmapas. This means that I have the responsibility to protect the Karma Kagyu lineage. Please think about how strongly you feel, then put yourself in my shoes for a moment, and imagine how important it is to me to protect the autonomy of the Karma Kagyu. I understand that you support H.H. Dalai Lama one hundred percent and support completely the Gelukpa school which is the only school you are devoted to. The attempt to give full authority over the four schools to H.H. Dalai Lama, however, cannot be supported and indeed does not have the support of any of the other schools. Now I will move away from your letter and present you with a question for reflection: if you use the political situation at the time of the 10th Karmapa to prove that the Dalai Lamas have the authority to recognize the Karmapas, you should also consider that from the time of the Great 5th Dalai Lama it has been obligatory that the reincarnations of the Dalai Lamas be approved by the Emperors of China. Setting the precedent that you attempt to do here, how will you prevent in the future, the Chinese government from claiming its historical right to recognize the Dalai Lamas? The heads of the Karma Kagyu, Drikung Kagyu, Nyingma and Sakya lineages have never required the approval of either the leaders of China or the Dalai Lamas. The precedent you are setting here will pave the way for the collapse of every school of Tibetan Buddhism, Gelukpas included. Please consider the long-term effects. The general outrage surrounding the whole Karmapa controversy is starting to resemble the howling of crafty coyotes so enthralled by their hunt that nobody can hear the soft voice of a lamb trying to sound a warning. Situ Rinpoche totally failed to prove the so-called prediction letter to be authentic, yet still this letter is waved around by many of his collaborators as some kind of authentic proof. Since you came to my problem voluntarily, I will offer you advice. You are known here in the United States as a prominent Buddhist, a respected Professor of Indo-Tibetan Buddhism and a political activist. I therefore request that you not be a “package believer” and fall prey to becoming a fanatical Buddhist. Buddhism usually teaches people how to think, how to judge, how to evaluate. The young generations of this country badly need training in how to think and evaluate. This I can see clearly. In the last 25 years of experience in the USA , I have seen that every decade people are becoming more and more machine-minded and naive. If they see something special or interesting they don’t know how to go and explore the background. Instead, they follow it like a stream of water winding forwards and never looking back. This is a great nation formed by very, very wise people. If the people of today don’t learn how to judge religion, politics and leaders, I am afraid that one day this great country will fall into a dark age. You are a professor of Buddhism, a political activist, and a Buddhist, so I encourage you to not mix up these many facets of your life. For example, your political campaign for Tibet should not be mixed with your job as a scholar of Tibetan Buddhism. My personal request to you is to not to be sectarian in your profession, and to please be an honest scholar. I don’t see any benefit for the US to participate in and spread this sectarianism. To be Buddhist is enough. When I see the type of response you wrote in the case of Lea Terhune, I am concerned that you may one day go so far as to discourage students and speakers who have ever critiqued H.H. Dalai Lama or the TGIE, and further, even discourage or block the careers of anyone who is friends with any such people. Buddhists should not violate the freedom of religion and discriminate against others. In a country like the United States, which prides itself on democracy and freedom, it is a shame that a tradition like Buddhism can be used to suppress and limit people.